Low cost business ideas that you can start this 2019. If you have the entrepreneurial spirit but not take a decision if you start a small business or not. So start preparing because 2019 has a great chance to succeed through it. Whether complex or simple, this idea will be among the foundations that will help you decide whether to push through with your business plans or not. Check out this list of 20 low cost small business ideas for 2017 that you can get ideas and inspiration from. Here is a list of the best low cost small business ideas. 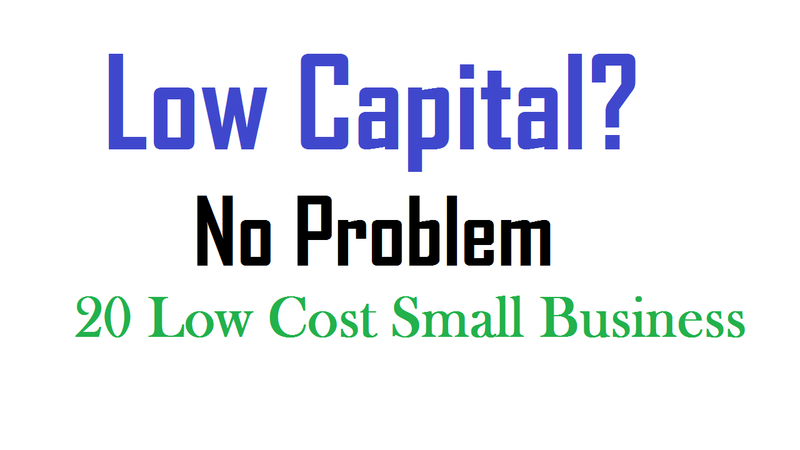 The cleaning business is a very profitable low cost small business. Before you decide to start your cleaning business, make sure this kind of work is right for you. You will need to be in good physical condition. Cleaning is very hard strenuous work. A good relationship will you to get more customers. You will need to have basic office skills and some accounting skills. This service helps busy clients prepare for a wedding party. They just tell you what they want then it’s up to you to deliver. It will be your job to make the lives of your customers easier while you help them have the party of their lives. T-Shirt painting is very famous and profitable business nowadays. Young people are mainly involved in this business. Mostly young people are the buyer and seller. Creative minded people have a great chance to succeed in this field. You can also provide uniforms for small businesses or create shirts for an awareness group. Low-cost small business- Gym. Financing gym equipment is one of the great challenges for this business. Once you get past that, expect people to go to your gym in droves. With the increase in health awareness, fitness gyms are always in demand. Most people want to restore their houses to its former state, but they were frustrated due to the lack of information about restoring old homes. If you have architectural skills and creative mind and can restore homes, then there are great business opportunities in this field. It’s a great job. If you think that you are quite enough for cooking then you can think over it to start a business. Personal chef services like you can arrange a course to teach other or home delivery business. Food shop is an amazing business that you can start. Food is a basic need and its demand never reduces. Altering clothing on a daily business is a tender, even for those who love sewing. Passion and attention are enough for this business.to know detail are just some of the personal characteristics required to start a clothing alteration business. If you’ve got a penchant for boxing things up and you’re organized and efficient, you can ease the process with a packing/unpacking service. House sitting is Lucrative small business ideas. House sitting business can be taken as a side business. The home design and improvement industry is hot, and hot and is showing no signs of cooling off. You have skills. You have experience. You have wisdom and knowledge and talent, and you want to pass it on. So start a training business. Tutoring is the safest business to start up. It demands nothing but your knowledge. If you have space to make a garden and you are very fond of it then you can take it as your business by supplying your product in the local market. If you have an idea about planning and arrangement then why you don’t start an event planning company start a business. If you good at hairstyle or make training on it. Start a business as the hair stylist. If you good at makeup and have knowledge or make training on it. You may start a business as makeup stylist. House painting business demands nothing but your color and painting since. Nowadays blogging is so good and smart idea of business. You know to make crafts? So make it in huge number and supply it to the wholesale buyer.